Selecting containers that are appropriate for arrangements is fundamental to a designer's success. 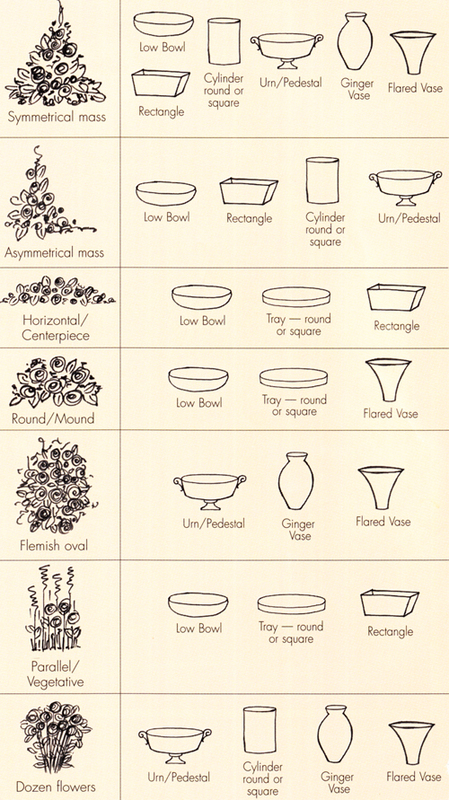 With this chart below (provided by Florist Review, June 1998) they offer suggestions as to which containers are best used with today's most popular arrangement styles. Obviously, there are some exceptions; use this chart as a guide and quick reference, not necessarily as the final word for your selection of containers. "As the picture frame is to the artist, so the container is to the flower arrange. Each serves to contain, accent, and properly display the finished products." - Bill Hixson, floral designer.